"Merit and demerit made conspicuous, or, The pillers of the publick prov'd," T. Kitchin, 1756, Walpole Library. 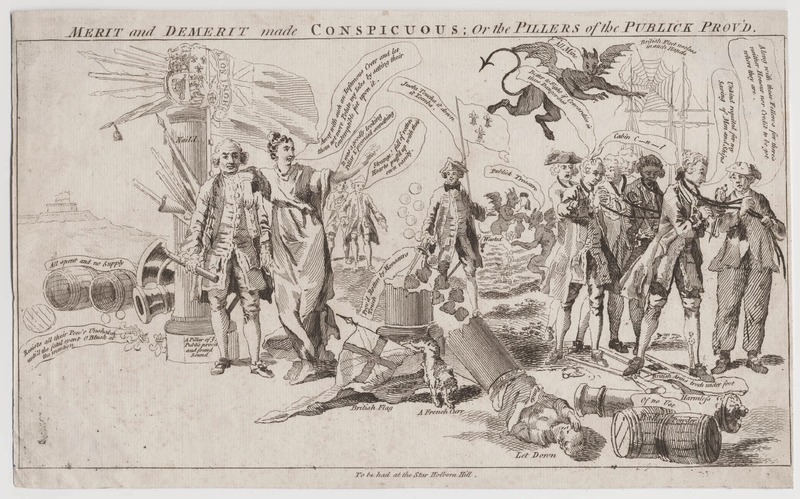 Even for eighteenth century political cartoons, this one is dense and crowded. It appears to show the depleted stores and finances of England, and expresses the frustration of the artist with the ministry. Jack Tar stands on the far left, gripping the ropes that have been slipped around the necks of numerous gentleman, who Jack berates for their ineptitude. He wears a reversed cocked hat that is notably pinned in place. This is interesting not only because it is the first time I've seen such a method for keeping the flap up, but also because the hat has a button on it. What purpose does the pin serve, then? Jack also wears a single breasted short jacket with large buttons that ends at about the top of the thigh, with open mariners' cuffs that do not appear to have any button closure. His trousers end above the ankle, and he wears round toed shoes with rectangular buckles.